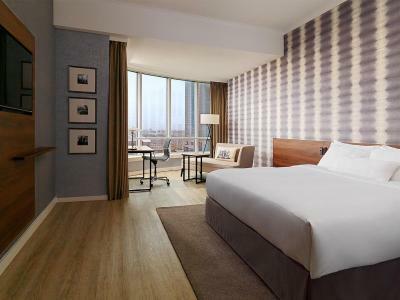 Lock in a great price for Rotterdam Marriott Hotel – rated 8.6 by recent guests! I like to stay at this hotel. The room is big and clean. The location is great as located in front of the central station. Everything!! The staff was the best I’ve had. The bed was on par with mine at home and nothing beats my bed. Spacious room with a great view. Comfortable bed. The hotel also has an amazing restaurant called The Millèn, which is great for a special night out. 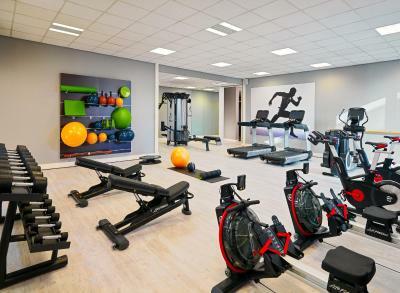 Excellent gym, great bike rental and location clean se to the railway station. The front desk staff was amazing. They were helpful ,always pleasant ,and very welcoming. Housekeeping staff completed their work early and efficiently, My experience could not have been better. I highly recommend this Marriott and encourage others to stay here . We paid extra to get a upgrade so we can check in early. The hotel was strategically located in rotterdam(just next to the central station and near china town). The staff were very helpful. I also tried their gym, not bad. Up to date and Clean, great location and view over the city. 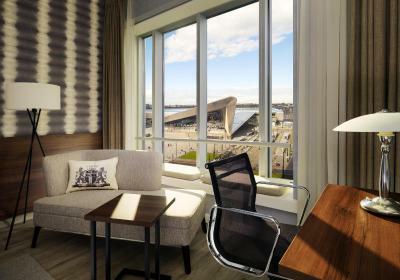 Rotterdam Marriott Hotel This rating is a reflection of how the property compares to the industry standard when it comes to price, facilities and services available. It's based on a self-evaluation by the property. Use this rating to help choose your stay! 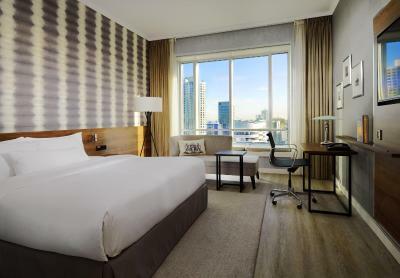 One of our top picks in Rotterdam.Rotterdam Marriott Hotel offers elegant rooms with modern facilities in the Millennium Tower, directly opposite from Rotterdam Central Station. 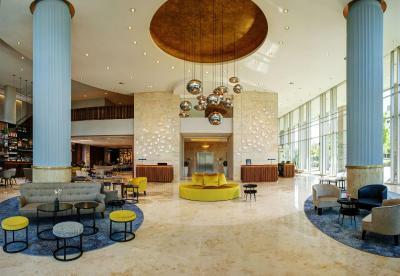 Guests can enjoy the on-site bar Pillars Bar & Kitchen. Free WiFi is available throughout the property. Parking is available on site. The 228 spacious hotel rooms feature views over the city’s skyline. Each room is air-conditioned and equipped with amenities such as a flat-screen TV with a dedicated TED channel, USB & HDMI portals, air-conditioning, a mini-bar and tea and coffee making facilities. Rooms feature a marble bathroom with a separate shower. For your comfort, you will find slippers and free toiletries. The M Club Lounge offers exclusive access to all guests staying in an Executive Room or Suite. In the lounge you can enjoy complimentary breakfast in the morning and drinks with Hors d’oeuvres in the afternoon. 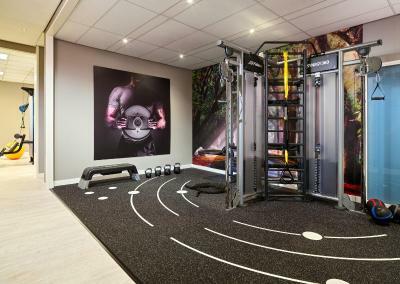 A 24/7 hour gym is available for guests, as well as valet parking. 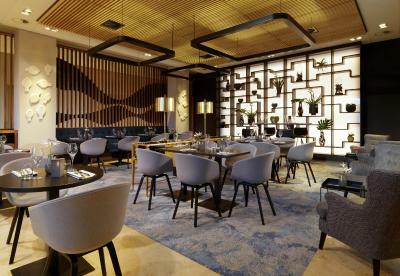 The hotel’s new bar and restaurant ''Pillars Bar & Kitchen'' has recently been opened in the lobby on the ground floor. Pillar’s menu lists Bites, Social Sharing and Casual Entrées and guests can enjoy a selection of 25 wines by the glass. Breakfast is served on the first floor, featuring views over Rotterdam Central Station, on weekends and holidays until 11.30. Chef Wim Severein owns and operates his high-end restaurant, The Millèn, located on the first floor of the Rotterdam Marriott Hotel. The well known chef presents his famous signature menu: beautiful dishes made with fresh, honest and seasonal ingredients. Restaurant The Millèn is a culinary hotspot in the heart of Rotterdam. Bike rental and car rental are available at this hotel and the area is popular for biking. 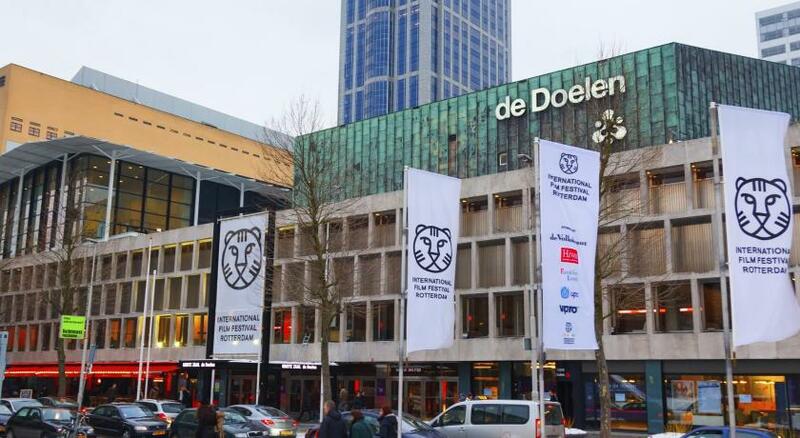 Rotterdam’s main shopping area is less than a 5-minute walk away. 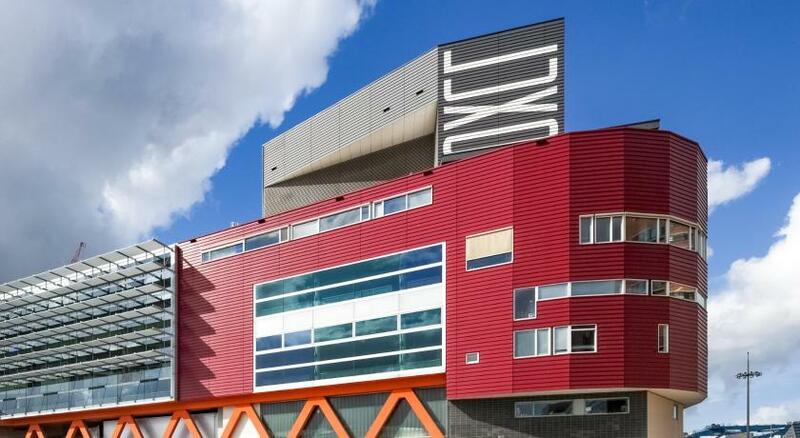 The Hague is 13 mi from Rotterdam Marriott Hotel, and Utrecht is 30 mi away. 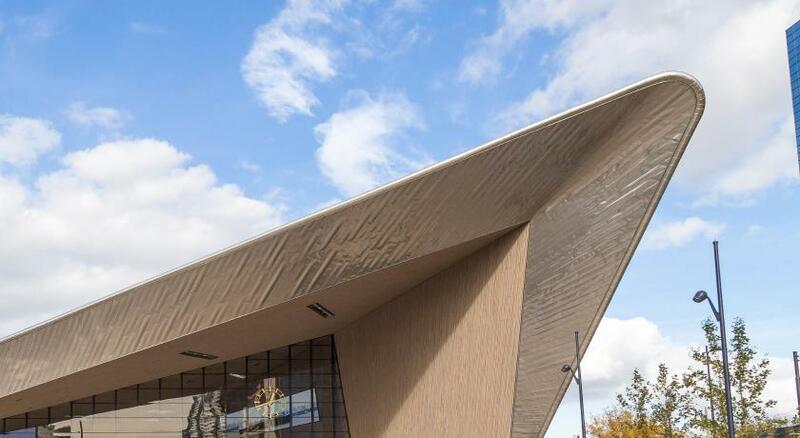 The nearest airport is Rotterdam The Hague Airport, 2.5 mi from Rotterdam Marriott Hotel. International trains such as the Thalys, Deutsche Bahn and Eurostar all arrive at Rotterdam Central Station. 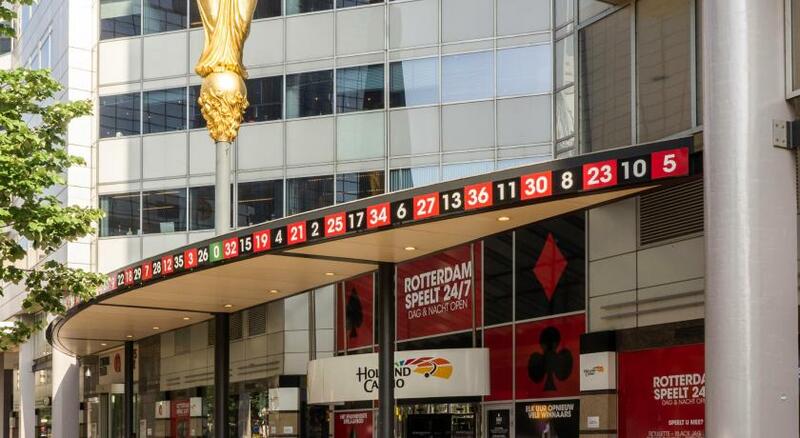 Rotterdam Marriott Hotel is physically connected to De Doelen Concert Hall and Holland Casino Rotterdam is only 800 feet from the hotel. When would you like to stay at Rotterdam Marriott Hotel? - a spacious, luxurious bathroom. - M Club Lounge access with complimentary drinks and snacks. This room comes with free late check-out until 16:00. This double room has a cable TV, bathrobe and air conditioning. These rooms are located on a high floor with city views. House Rules Rotterdam Marriott Hotel takes special requests – add in the next step! Rotterdam Marriott Hotel accepts these cards and reserves the right to temporarily hold an amount prior to arrival. Please note that bookings for groups of more than 9 rooms are not accepted via this website. Please note that if you arrive within 7 days from the day you made the booking on, you are required to show the credit card you made the booking with. Please note that extra beds can only be placed in the Executive Rooms. Please note that parking in a parking garage (no reservation needed) is possible against a surcharge of EUR 27 per day. Valet parking on site (no reservation needed) is possible for EUR 40 per day. towels is not provided sufficiently. pillow is not provided for the extra bed. The view of the executive room, and also the room itself, something wonderful. The access to the lounge 24 hours is also a must. Location is great. Room view to Rotterdam Central Station is also nice. No problem to park the car in front of the hotel for a short time. Comfy bed and a bathroom with shower and bath is always nice if not expected in a five star. The service of Ahmed and Cynthia stood out with both helping out with special requests. The room was good but I remember at Saint Diego they upgraded me to junior suite with access to lounge and here I am in the Executive floor but could not have access to business lounge !!!! Sheets should be changed more often. Mini fridge not stocked. Bathroom had no bathrobes or slippers, asked for them and waited for an hour to get them after which they brought just one set, asked for another set but only got another bathrobe and no slippers. There was no turndown service and they only had one small shower gel and shampoo, the body lotion was leftover from another guest (just had a few drops left)! Asked for a toothbrush- it never came. The room was very basic and dated. On the next day we asked for a late check out and they started charging from 12:00- no grace period and at an hourly fee of €25/hr in addition to a room price of €350.